"We worked with four realtors on the North Shore and NW suburbs in our search. She was/is by far the most responsive, and interested in finding a home that fit us, rather than just trying to shove us into whatever was in the pipeline. She went through detailed analysis of homes - looking at past tax records to understand the types of investments made into the homes she showed us. We ultimately found our home because she knew the area really well. She knew exactly why the location (walking distance from schools) and community (cozy, tight-knit neighborhood) would suit us, drove out to look at it herself - and explained the local history of the house (all of the above, not part of the seller's information). When we arrived, we knew it had exactly what we needed, and she helped us move quickly enough so that our kids started the school year in the new district, in our new house. We would highly recommend Aly for her knowledge, energy and keen interest in matching families to homes & communities. " -Cynthia A. "Aly and Justin were incredibly professional and knowledgeable during the entire home buying experience. With it being our first time buying a house, they were always there to offer an honest opinion on many of the houses we looked at and when the time was right, acted quickly on the home we ended up purchasing. Overall, it was a great experience and I would highly recommend them to anyone looking for a house in the Chicagoland area! " - Dustin T.
" Very professional always followed thru with plans. Worked with buyers to make a sell. Always ready for open houses, worked with our cats and dog. Worked out with the demands of buyers. Gave us open ideas for improvement on house. " - Linda F.
" Justin and Aly are top notch! Their high level of expertise, patience and willingness to go above and beyond was incredible! We will for sure want to work with them in the future!" - Susan V.
" We happened to put our home on the market during a very difficult period (around the holidays). Aly and Justin worked tirelessly and we never got the sense that they were frustrated. Furthermore, they made us feel like we were their only client and were infinitely patient - answering every call, text, and email in a timely fashion. I've bought and sold many properties and I can honestly say that they are among the very best I've ever worked with and wouldn't hesitate to work with them again in the future." - Max A.
" Aly & Justin were great from start to finish. We knew very little about the area and the knowledge they came with at our first meeting was 100% what we needed. They made us feel comfortable and brought expertise to the entire process. We would highly recommend using them." -Tricia H.
" Justin is a skilled and passionate real estate professional. He and his partner (Aly) are fully committed to providing the upmost level of service and advice wether you are buying, selling or renting a home. And he's a great guy to go with it. I couldn't recommended him highly enough." -Michael B.
" 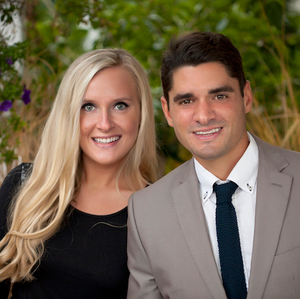 Justin and Aly have great knowledge of the Chicago and outer suburbs and have helped me throughout my search. I'm currently renting in the city but Justin has helped share all information needed for buying a condo when requested. I would recommend him to anyone looking to purchase a new home." -Charlie G.